Every day, Google is taking steps to try and make our lives as ‘search engine users’ easier, by providing answers more quickly, more accurately and in the right format. But imagine if you found the exact answer to your query, without having to click, not even once. It’s already happening. 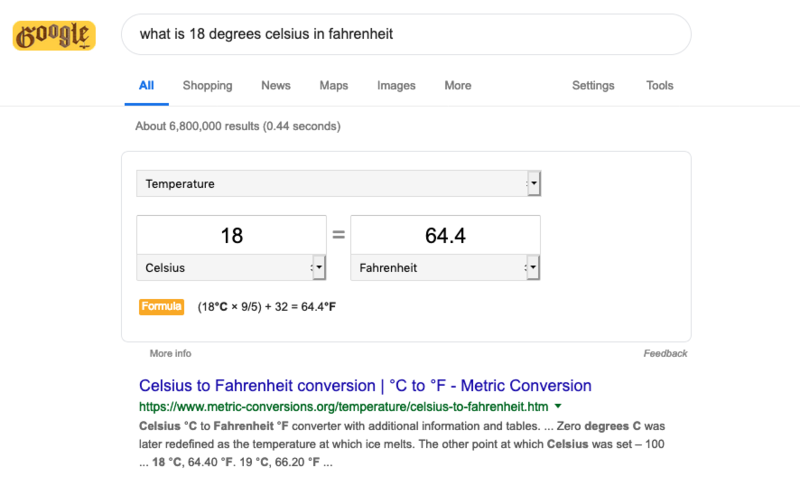 Ask for a temperature conversion, the time in another country or perhaps when Valentine’s Day is and you’re likely to see the answer right there, with no clicks required; if you trust what Google is telling you. This is a zero click search result. Core features on a Google search results page (SERP) include paid ads, image/video (media) results and featured snippets, all of which have taken over the top spots and can provide a definitive answer to a question. A featured snippet works by pulling a short answer from a webpage directly into the SERP, whereas a Knowledge Card block or a Google Instant Answer, are database entries featuring facts and data that are pulled in. These results make clicking on other more traditional types of search results redundant. This is brilliant UX, but for an SEO, the situation is not quite so brilliant. Both because a zero-click result is hard to achieve but also, it’s unlikely to deliver web traffic to the site being optimised and traffic is usually the main objective of SEO. But if you are wanting that top spot, that position zero so to speak, how do you optimise for zero click searches? Database-style searches: Search queries based on dates, times, names and ages of famous people, currency conversions etc. Encyclopedia and dictionary-style searches: Search queries around “synonym for”, “what is”, “definition of” etc. Up until fairly recently, keyword (or keyphrase) research has included search volume, keyword difficulty and current position figures. From now on, the clicks per search (CPS) figure should also be part of your keyword research process. The benefit of this is it helps you consider actual traffic potential, not just search volumes on their own. The higher the CPS, the more chance there is that you can receive some web traffic even if you’re ranking in a lower position like 4 or 5. By looking at the click per search, you’ll see if a key phrase already a large search volume figure but a low or zero click potential figure. There are three main types of featured snippets; paragraph, list and table. Run a ranking report on your long tail target phrases and look for those that are already ranking in the top 10 positions. Remove the phrases that already have a featured snippet result appearing on the SERP and the rest of the list are usually opportunities for you. Some SEO tools like Serpstat and SEMRush have a feature to help with this. And if you are seeking new ideas, use the People Also Ask feature at the bottom of a Google SERP – there will be other keyphrases that you might be able to rank for and achieve a snippet for. Ensure the web page you are trying to rank for with a paragraph featured snippet contains a short and accurate answer to the search query question that totals or is below 55 words. Place it as near to the top of your content page as possible. Ensure list content that you want to rank for is organised clearly. Use headings such as Step 1, Step 2, etc (more than 8 steps will be truncated and a ‘More’ link added by Google). And again keep below the 55 words mark in total. Ensure that if you are aiming to rank with a table, include the content in table format high up on your page and also mark it up using the <table> tag. Be sure about which content you want to rank for zero click searches, because at the end of the day, users are unlikely to be clicking through to your site via that zero position result. Keywords with a high CTR can also rank more content on the first page, so plan comprehensively for rankings, not solely for snippets. Your site needs to already perform well and serve users with in-depth content. The vast majority of web searches are simply never going to have one definitive answer and some queries aren’t even traditionally formed questions. Featured snippets don’t come with any guarantees. Once you’ve earnt one, it doesn’t mean you will keep it because another website might come along in a few weeks or months with a better answer than yours. If you have any questions, please give us a call or let us know in the comments below.